NOTE-SPORK IS NO LONGER IN BUSINESS. Spork in San Francisco is my new favorite restaurant. Pat and I went there for dinner after a lovely day in the Mission, checking out all the vintage stores and eating Dymano Donuts. 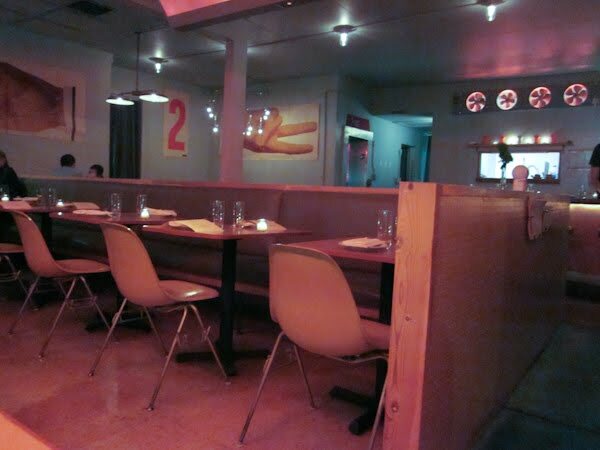 Spork is a place serving old-school classics in a new-school fashion. They have sustainable-this and local-that versions of slow-food takes on old classics. And despite the political correctness of their offerings, everything tastes like it was pan-fried in lard in a steel skillet by my grandmother. That's a very good thing! The In-Side-Out Burger ($14) screamed "eat me" from the menu. The beef is fresh from Sun Marin Farms. Two patties griddle-fried, peppery and crispy on the outside. Moist and pink on the inside. The concoction towers over the plate. 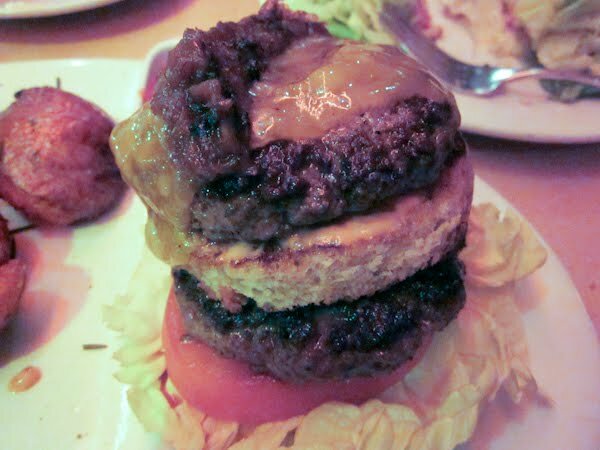 It is a stack of ingredients as follows starting at the plate: Butter lettuce, tomato slice, beef patty, bun circle, special sauce, beef patty, tillamook chedder and a grilled onion topping so sweet it could be applesauce. The special sauce reminded me of the spicy thousand-island type I make at home, only no islands. You have to eat this with a fork and knife, but it doesn't diminish the burger experience. The Smashed Fries are an interesting idea. 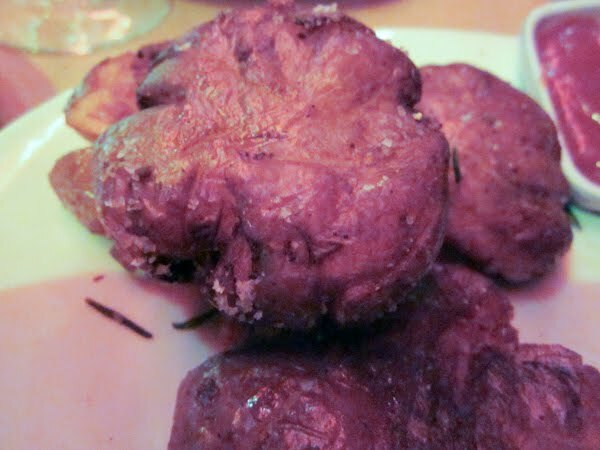 Small potatoes with the skins on, are deep-fried and smashed flat. They are crispy and salty and tasty. Not your classic fries, but a very scrumptious alternative like everything at Spork. Pat had the pork chop ($23). Big enough to feed a family of four, it was thick and juicy and perfect. For desert we had the After School Special ($6). Humphry Slocumbe malted vanilla ice cream with chucks of chocolate covered potato chips and caramel swirls. Enough said. As for the ambience, the place is in a converted KFC location. Turns out KFC invented the spork, a combination spoon and fork. The kitchen is in the old freezer. They have converted the old oven hood to a light fixture. We lucked out with a table by the window and watched Valencia Street traffic with more stylish bicyclists than cars. Go. Eat. 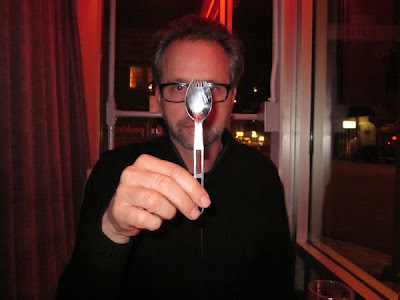 Spork. I don't think that KFC invented the spork. "Samuel W. Francis filed a patent in 1874 for a combination fork, and knife and spoon. Harry L. McCoy invented a cutting spoon in 1908 followed by Frank Emmenegger's tined edge spoon in 1912. However, the first person to actually file a trademark for the term "Spork" appears to be a man named Hyde W. Ballard (although there is no official record of this). The term eventually passed down to The Van Brode Milling Company in 1970, but they stupidly gave it up to the UK's, Plastico Limited in 1975." That inside out burger looks absolutely delicious. I have to put that on my to try list for next time I head out to San Fran.